Coca-Cola and Live Nation are teaming up on a multi-year strategic sponsorship, which will provide The Coca-Cola Company with a broad range of integrated marketing opportunities spanning Live Nation's venues, concerts, content, VIP experiences and online ticketing and ecommerce operations throughout the United States. The sponsorship agreement will make Coca-Cola the official soft drink of Live Nation, granting exclusive pouring rights in the majority of Live Nation's venues in the U.S. for a variety of products in The Coca-Cola Company portfolio, including sparkling beverages, water, enhanced water, sports and isotonic drinks, as well as ready to drink teas, coffees and juices. "Taking in a live musical performance with an ice-cold Coca-Cola in hand is the ultimate way to 'Open Happiness' and enjoy one of life's simple pleasures," said Beatriz Perez, Senior Vice President, Integrated Marketing, Coca-Cola North America. "By being part of Live Nation's comprehensive network of venues which showcase some of the biggest tours and superstar artists, we'll be able to offer people exciting new ways to combine their love of Coca-Cola and music before, during and after the show." This holiday season the 12 million members of My Coke Rewards will gain access to bid for Live Nation tickets, artist merchandise and VIP trips to House of Blues shows across the country. 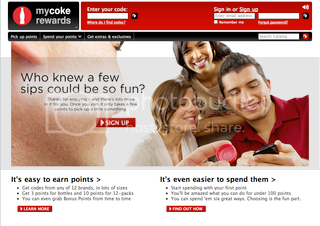 The promotion seeks to reward Coke customers while selling incremental tickets to Live Nation concerts. "Live Nation's live music platform is unparalleled in its ability to consistently connect the world's most prominent brands with their customers through one of the most powerful mediums available - live music," said Russell Wallach, President of National Alliances at Live Nation. "Utilizing Live Nation's network of venues, concerts, ticketing and online assets, The Coca-Cola Company will fully tap into the power of live music and its intimate connection with millions of fans to further build on the immense popularity of its beverages."